Enjoy succulent steaks, fresh seafood and decadent deserts dining alfresco with lush views of subtropical gardens. 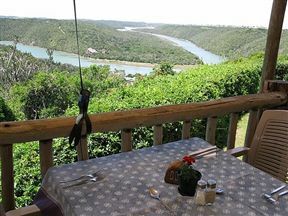 Stanley’s boasts splendid views of Kariega River along the Garden Route. Noted as the best restaurant in Kenton, Stanley’s invites sumptuous cuisine and complimenting wine list perfect for alfresco or cosy indoor meals. Having returned to Kenton in May 2011, my wife and I visited Stanleys Restaurant. This place has the most spectacular views and food to match on the sunshine coast. Hosts Rodney and his wife have made this restaurant their own with good, old-fashioned hospitality. Stanley's Restaurant is 3.7km from the centre of Kenton-on-Sea , the nearest airport 120.3km (Port Elizabeth Airport).